Shortly after moving to a northern suburb of New York City in 1965, my new schoolmates asked me to choose a side in a classic rivalry. The Mets vs. Yankees could wait until later (I chose the Mets), they wanted to know if I preferred Quisp or Quake, because breakfast cereals were much more important to five-year-olds than baseball teams. The ad was animated by Jay Ward, the creator of Rocky and Bullwinkle, and used many of the same voice actors. More ads followed, each promoting the rivalry between the two cereals, which eventually culminated in asking viewers to vote for their favorite. Quisp won the vote, and Quake was discontinued, a pattern I had already seen with my baseball choice: despite a “miracle” season in 1969, the Mets soon wound up in the basement. 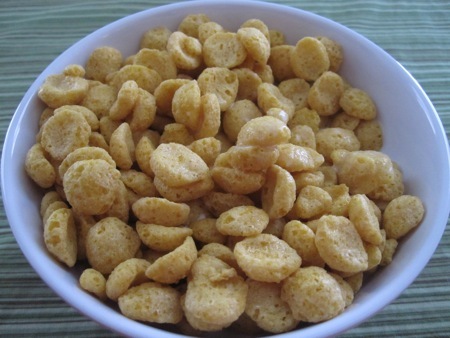 But it tasted the same, and, in the interest of thorough research, I once again compared it to Cap’n Crunch (just a small handful, my metabolism can no longer handle large quantities of processed corn sugar) and came up with the same result. World-class cereal-eating is a dance of fine compromises. The giant heaping bowl of sodden cereal, awash in milk, is the mark of the novice. Ideally one wants the bone-dry cereal nuggets and the cryogenic milk to enter the mouth with minimal contact and for the entire reaction between them to take place in the mouth. … The next-best thing is to work in small increments, putting only a small amount…in your bowl at a time and eating it all up before it becomes a pit of loathsome slime, which takes about thirty seconds in the case of Cap’n Crunch. Quisp may be hip, but the Cap’n abides. I can remember ads for Quisp, but I don’t think I ever had any. The Cap’n had the best toys, anyway. Cap’n Crunch had the bosun’s whistle which allowed you to make free calls if you played the correct sequence of notes into a phone. That’s why one of the original phone phreakers, Dan Draper, was called Captain Crunch. Today’s version of that prize would be a plastic box that would let you use any WiFi signal you could find.